For 25 years, Montolieu has been known as the Village of the Book with 15 bookshops of old and used books and the Museum of Arts and Crafts of the Book, but its history is much older. This is evidenced by prehistoric remains such as Guittard’s menhir, or the remarkable stone with cup and cross inscribed in the village, on a house, facing the street that descends from the church. Other stones with cupules are visible in the commune, towards the castle of Villeneuve, or the farm of Peyremale. Various ancient debris could be found in the vicinity of the village: fragments of amphorae, shards of pottery, bronze elements… Large clumps of metallic slag at the bottom of the butte Saint Roch may partly go back to the Gallo-romaine time. 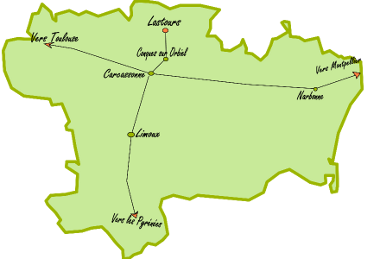 The district of Valsiguier, in Montolieu, was the subject of a study by the Amicale laïque de Carcassonne before the municipal works. The team brought to light an abundant archaeological furniture dating from the last third of the thirteenth century and the first third of the fourteenth century. According to the hypothesis of the archaeologist Marie-Élise Gardel, it would be the suburb destroyed in 1243 to punish the population rallied to the cause of the son Trencavel during the revolt of 1240-1242.